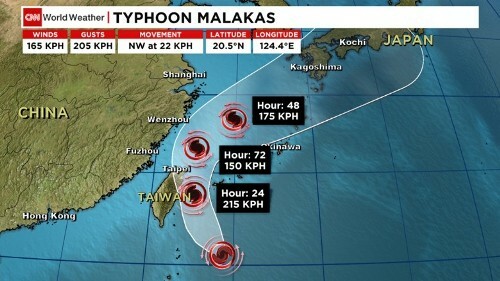 Taiwan is about to be soaked by its second severe storm in just three days, with typhoon Malakas forecast to pass by the northern end of the island early on Saturday. The tropical storm will tear past Taiwanese capital Taipei at around midday and is forecast to reach as high as a category four hurricane, with wind speeds exceeding 125 miles per hour (200 kilometers per hour). It comes just two days after typhoon Meranti made landfall on the southern coast, leaving hundreds of thousands of homes without power. On Friday afternoon, typhoon Malakas was hovering off the eastern coast of Taiwan and is forecast to curve up the country’s coastline, growing stronger and passing Taipei, before heading towards Japan. “Even though the storm is not forecast to make a direct landfall on Taiwan at the moment, areas towards the north of Taitung county are forecast to receive tropical storm force winds beginning Saturday afternoon and lasting into Sunday morning,” CNN meteorologist Michael Guy said. Taiwan’s Central Weather Bureau issued a typhoon warning for parts of the country on Friday, ahead of the storm’s arrival.